My role as Assistant Chief Minister is to advise the Chief Minister and to lead on various areas of social policy. Turn the pages of any newspaper, switch on the TV or radio and listen to the passionate conversations in pubs and sitting rooms and you will repeatedly find social policy issues at the core of those debates. It’s about the big questions in life, the things that affect a person’s quality of life, like caring for vulnerable people, safeguarding children, supporting people with disabilities and developing the charitable sector. I chair the group that looks after the interests of children and vulnerable adults and I work closely with other ministers and assistant ministers on a wide and challenging brief. I like to think of my job as putting in place policies and systems that maximise Islanders’ well-being; and that doesn’t come cheap. If we look at average spending in recent years, around 70p in every pound is spent on things like pensions, benefits, hospitals and schools. That amounts to nearly three quarters of total public spending. Population is one of our big issues and it impacts on many areas of our lives, like education, health, jobs and housing. It is government’s priority to find a balance, so we can maintain our workforce, enable the economy to flourish and public services to be sustained without threatening our environment and way of life. We use a number of means to achieve this. The Control of Housing and Work Law sets the parameters, and I work closely with Back to Work, and organisations like Digital Jersey and Jersey Finance, to help businesses achieve their goals while also protecting our environment and maintaining jobs for local people. Any businesses wanting to employ registered or licensed staff need to show they have explored all options for employing entitled people before applying to the Population Office for a license. Anyone who is unhappy with that decision can appeal to the Housing and Work Advisory Group, which I chair alongside the ministers and assistant ministers for Economic Development, Housing and Social Security. I understand that the prospect of more people moving to the Island raises concern about competition for jobs and pressure on our land capacity and services.​ However, if there were no migration in or out of Jersey for the next twenty years, the proportion of Islanders aged over 65 would nearly double and more people would be retiring than starting work. We cannot maintain good quality services in these circumstances. This is why we are planning for limited migration of 325 people per year – focusing on bringing essential skills and investment to our Island. 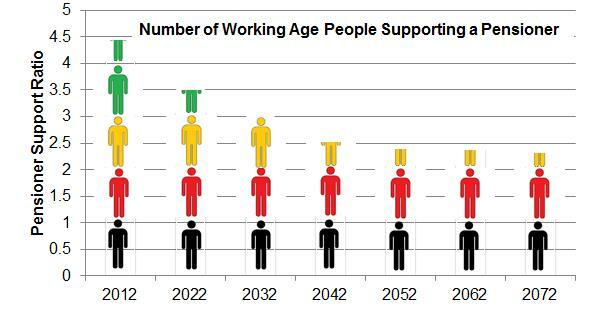 Even if we achieve this, we can see from the diagram below that in 2012 there were 4.3 working people supporting each pensioner, in 2032 that reduces to three workers, and by 2072 that is down to 2.3 working people supporting each pensioner. I count myself among this growing band of pensioners, and my concern is to leave my children and grandchildren a healthy economy that can sustain them into the future. Many of the challenges we face in Jersey are linked to this changing age profile. It is already affecting policies on pensions, health care, employment and housing. Actuaries have said we need to take action to keep our Social Security fund in good health. In future we may need to increase contributions, raise the earnings limit, increase the pension age or a combination of all three. So how can we continue to help our economy thrive, keep our island special and provide the services we all need? These are the issues I and my ministerial colleagues are facing and it would be wrong to ignore these future challenges. We are investing more in health care, in promoting healthy lifestyles, in educating our workforce and in better housing. These are just some examples of social policies aimed at improving wellbeing and social justice for all islanders. We will continue trying to find the right balance between all the competing pressures on our small island home.